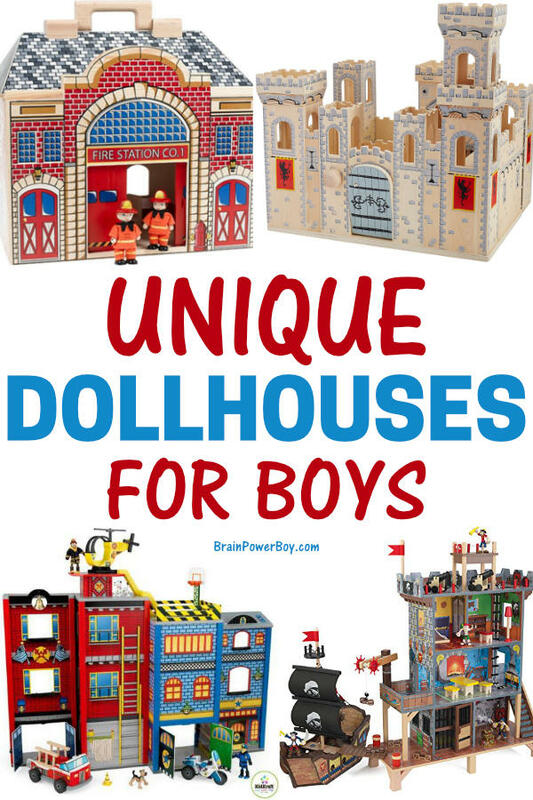 Here are some unique dollhouses for boys! I recently saw a couple of very different houses and decided I really needed to cover them as they were so neat. So here they are! We are fond of wooden dollhouses and so will focus on those once again. They are totally worth the money. Buying a dollhouse for your boy will provide him with years of open-ended play opportunities. I highly recommend them as a play and learning toy. Check out our gift guides for boys for other fun play and learning ideas. The house styles change often and many get discontinued. If you see a house that is the perfect fit as your boy’s dollhouse, I would suggest you go ahead and buy it before it is gone. I will do my best to keep this article up-to-date but may need to change out houses that are no longer available. 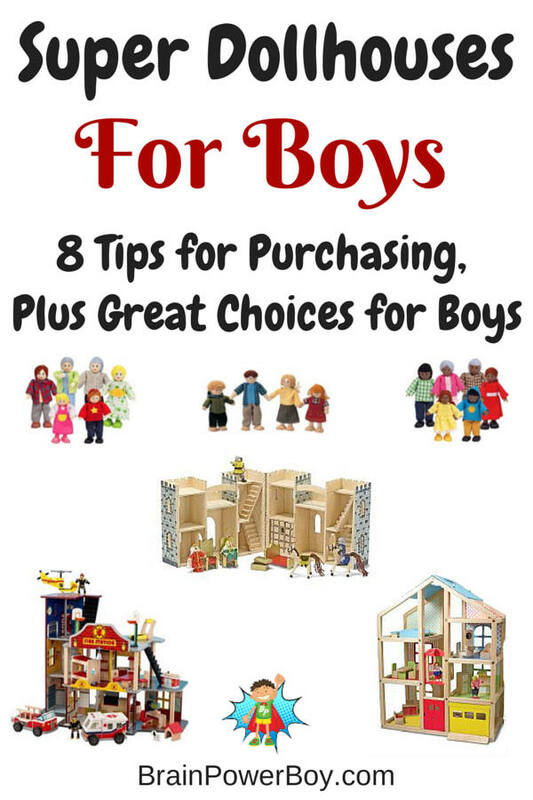 Be sure to stop by our first article so you can see the tips for buying the best dollhouses for boys (link at bottom of article.) We cover various considerations that you should take into account before making a purchase, as well as more houses. Oh boy! We found a new boys dollhouse that many of you are going to really like! 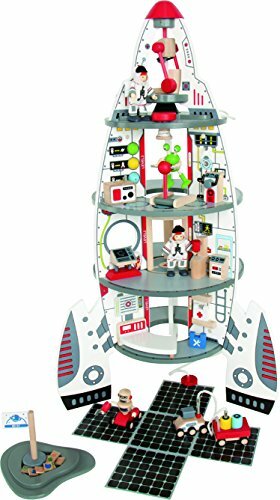 This Space Discover Center is made by the popular Hape company. It features a 37 piece set that comes with the 4 level center. I really like the artwork on this set and think you will too. Solid wood construction from sustainably sourced forests. 2 astronauts, robot, cart, working elevator & even an alien. Go see it. There are so many details I can’t list them all here. Bonus! The top comes off so they can use it like a spaceship. 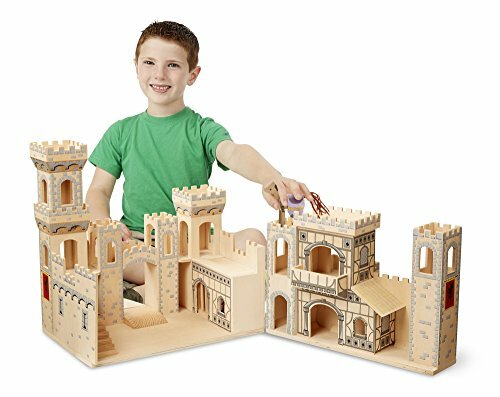 For nice large castle try this Deluxe Folding Medieval Castle. It is a good size and folds out allowing play from both sides. When they are done playing, it folds back up for compact storage. This is a very nice castle that is perfect for boys who like knights and all things medival! It doesn’t come with any accessories so you can buy this cute choice. 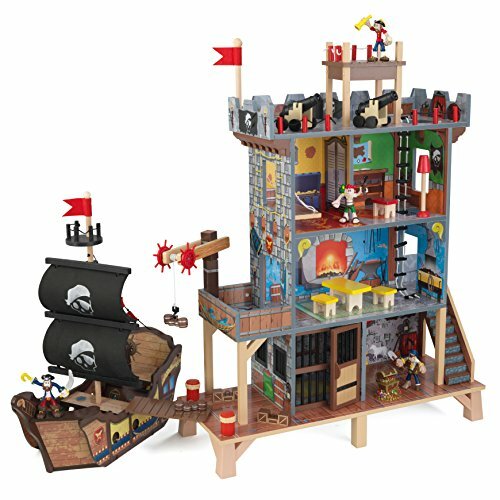 The Kidkraft Pirate Cove Playset Boy Dollhouse is one pirate fans will not be able to keep their hands off. It even comes with its own ship. Two of the cannons have sounds and there are light up features as well. Also has a rope ladder, a moving crane and even a jail cell! This house is made of composite wood and is strong and study for plenty of years of pirate playtime. 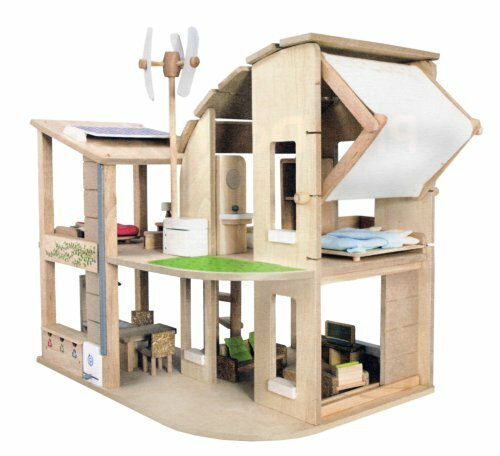 For those of you who are eco conscious try this house on for size: Plan Toys The Green Dollhouse with Furniture. You will want to order dolls for this house. The house is made of rubberwood. 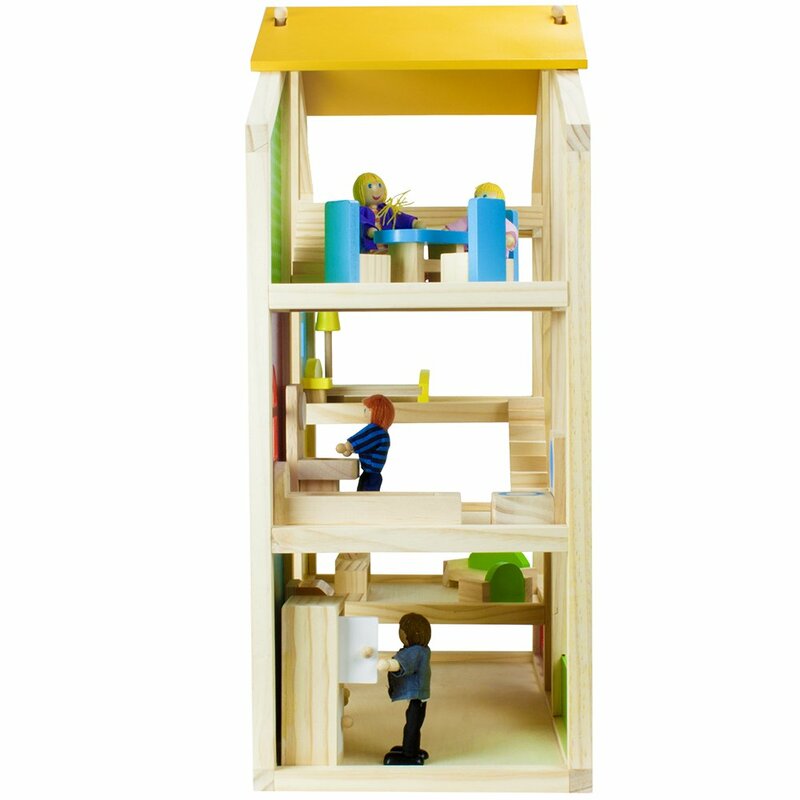 Plan toys makes wonderful, high quality dollhouses. It is very open which makes it easy to play with. The boy you are buying this for will like the colorful blue, red, green and yellow on the house walls. Go here to view it. I found a really wonderful fire station dollhouse. If you have a boy who gets excited when they see a fire truck, you will have to check this one out – your boys are going to love it! I really like this Kidcraft Fire Station Set. It has a nice big truck and fireman. It also includes a helicopter! There are 15 accessories in all. As you can see the inside walls are decorated, which is a nice touch and makes it more realistic looking. They can tell a lot of stories with this house. It is a VERY good value for the price. 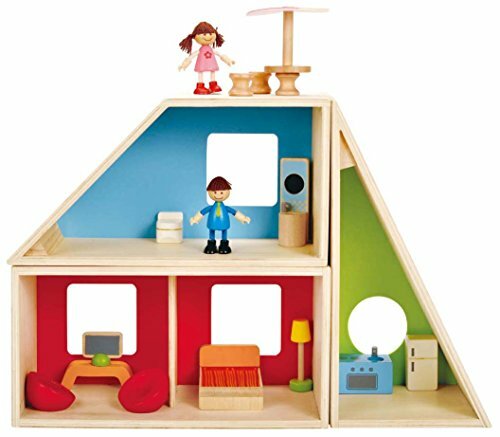 If you are looking for a versatile small dollhouse for boys, try this charming Hape Geometrics Play House set. This is very neat! Let them be an architect and build the house how they want it to be. He can take the pieces of this wooden dollhouse and arrange them in various configurations. It comes with a boy and a girl and some furniture. It is smaller than some of the other houses which is great for people who don’t have a lot of extra space or if you want to be able to move it around or take it to grandma’s house. We have so enjoyed our dollhouse over the years. As my son grows, I go through toys and give some away, but our dollhouse is a keeper. I will never give it away but will pass it down to his children when he has them. What this best dollhouses for boys article does is present a variety of houses that have boy appeal. Only you can choose the very best dollhouse for your boy. I do hope this helps you narrow things down and that you find one that will work for your family.